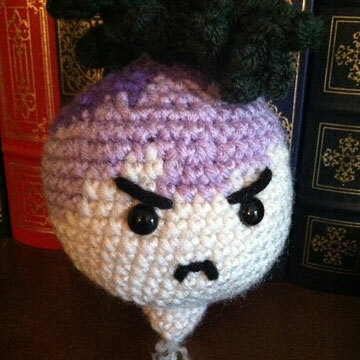 I guest posted this small story over at Grumpy-Gurumi for Ashley, who made this turnip from the general pattern in Yummy Crochet. It wasn't much but oh, well. Go check out her blog for some fun stuff. Things were not well during high school for rebellious young Theodore "Ted" Turnip. Leather jackets, switchblades, and slicked back hair covered Teddy's distant familial troubles hidden. He wasn't accepted among be any of his peers at Rootdell High. There was no singing and dancing his feelings. Eventually his long standing feud with Rickie Raddish, rich born Captain of the Rootdell Produce Football team, culminated in the fateful race at Deadman's Curve near Stovetop Gorge. ...and now he has returned as a wraith seeking vengeance on the guilty vegetables. Some say the wreckage and ghost can be seen at the bottom of Stovetop Gorge, near a little cave called the Kitchen Floor.